1. Come and check the handbags yourself if you are interested in, then you will know what I'm selling. 2. All the pics are real, so I added my signature in case someone else may take advantage of it. 3. 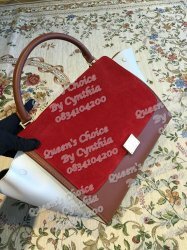 All the handbags or purses are unique, I can't get the same one/ same price for you in future. No more, But you can pay the full deposit and ask me to customize if you trust me, but will take long time this way. 4. Who pays first who get it, no booking. 5. U can find the same one @ CELINE's official website, but the color and size are might different, this handbag is produced in 2014, now is 2015. BUT MASTERPIECE IS ALWAYS CLASSIC. You get it. 6. Please do not go for the cheapest price blindly , the prices will always adequate to the quality of the products. You get what you pay off, seeing is believing.